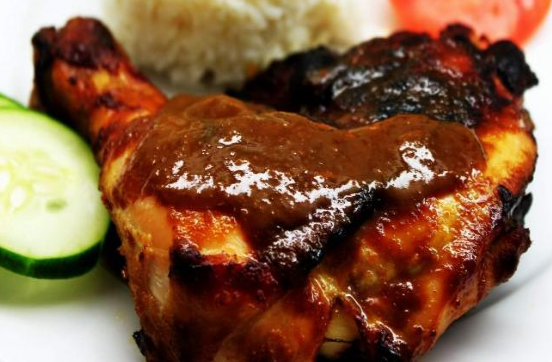 Recipes to Make Grilled Chicken Specialties Sedap and Grilled chicken is sebuha food menu that is very familiar to everyone, with a savory taste and there was sweet of her, too. Surely the countless certainly a lot of people who like the chicken processed this one, there are several Janis grilled chicken well that this time we will make is a grilled chicken honey. Grilled chicken honey is almost similar to roast chicken usual but the difference with his ingredients, roast chicken This one is his taste of honey that makes the taste of grilled chicken is so delicious, not only tasty but there are sweet, which makes it taste so very enjoyable. If for itungan many people who message the honey barbecued chicken, do not ask was tantamount many are enthusiasts of the honey barbecued chicken. At each restaurant or in a regular meal is no such thing like grilled chicken on its menu, but sometimes if something was fitting in your tongue or that is not right, it's according to your taste if so mah. Surely you want that fits on your tongue and pengan once if eating so very enjoyable, because if makananya tasty but we do not feel good it will be less sip dehh, but if instead but eating delicious, ehhh not in question and pokonya mah. Well for that you want to try the honey barbecued chicken recipe, you simply take a look down here. 1 whole chicken, which had been cut into pieces. Tamarind solution of 1 ½ teaspoons. 1000 ml of clean water. Brown sugar 1 ½ tablespoons. In the first step, which has been so subtle seasoning in stir-fry until fragrant aroma advance. After the seasoning that has been sautéed in the pan with the joint input of chicken also other ingredients, in boiled up so thorough and so soft texture of the meat and the lift kept in the drain. Grease was all ingredients with honey sauce while stirring until the ingredients are well blended so. Do not forget the chicken meat is also in the spread with honey sauce, well after the chicken burned, when fuel should be in the back and forth as adan make grilled chicken mediocre when burn. And while in the basting using honey so pervasive in daginya. If so, in lifting the grilled chicken. Honey roasted chicken ready on serve. Her reply tasty grilled chicken serve with rice and sauce warm white and lalaban his vegetables. Enough from us on the recipe and how to make grilled chicken honey, thank you for coming to our website, good luck yahh make her in your home. 0 Komentar Untuk "Recipes to Make Grilled Chicken Specialties Sedap and"